Father's Day is this Sunday, the time to honour and celebrate the first hero in our life. Whether he's the giant of a man looked up to by an adoring son, or the handsome knight revered by a devoted daughter, Dad is the one who provides quiet comfort and strength. If Mom is the framework of a family, holding it all together, Dad is the foundation, keeping it solid. At least such was the case for people like me, who grew up in the 50s and 60s. While mothers kept the home fires burning, fathers went to work, their role as a parent defined by the free time they had and the firmness of hand required. Helping with babies was virtually unheard of. For my generation, with kids born in the 1970s and 1980s, husbands, unlike their fathers, knew how to burp a baby and change a diaper. Generally, though, this happened only if their wives weren't around. 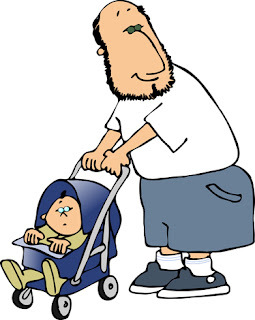 Today, fathers of course take a much more active role in parenting. They have parental leave from work after the birth. They are involved in every aspect of the child's upbringing, from bathing and feeding to carpools and even becoming the principle caregiver. Yet, when a soft shoulder is needed, it's generally to Mom that a child will run, while they turn to Dad for fun and games. Perhaps this is why, when it comes to recognizing parents on their special days, the message can be significantly different. Drawing on my own experience, as a daughter and a mother, Mother's Day is all hearts and flowers, while Dad generally gets less sentimental treatment. The gifts to Mom evoke oohs and aahs — because they should. It seems so easy after all to make the perfect choice for her since the options are endless — books, perfume, candles, soaps, clothes, jewellery, spa treatments, on and on and on. She also gets super excited about anything handmade. Dad, conversely, seems to be more difficult to buy for (think of the much joked-about tie). Besides being of simple needs, the things he actually really does like (now think of boys and their toys) are generally beyond kids' budgets. Whereas Mother's Day often means breakfast in bed for our favourite lady, on Father's Day we often take our hero out to a breakfast hosted by a local service club. Which, when you think about it, is actually more of a gift to his wife. I've noticed, too, an interesting practice in card selections for these two special days, too. When purchasing the right card for a mother, people tend to lean towards the sentimental. The greetings for fathers, however, are more about the punch line, almost as if we're afraid to be emotional with these big strong men. Of course, Dad's never seem to see these discrepancies. Or if they do, don't mind them. They love, or pretend to love, the tie. They never complain about where they're eating as long as they're going to eat. And who laughs the loudest at the goofy card? 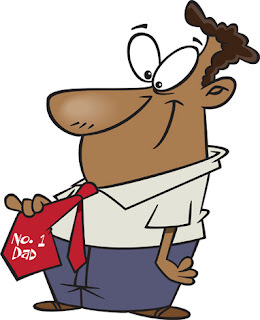 So in keeping with their simple acceptance of everything on their big day, here are some fabulous cartoons with dads at the heart of them, perfect for a personal message, t-shirt or some other creative project just right for your first hero.